PARANORMAN is an absolutely delightful, heart-warming, funny and beautifully visualised stop-motion animation film about a young troubled boy who finds acceptance when he saves his town from zombies. Norman Babcock (Kodi Smit-McPhee) is the classic emo kid bullied at school and a cause for embarrassment at home. The reason: he sees dead people. The social pain reaches a pitch during the school play when he's carrie back in time to when a little girl was similarly misunderstand by Puritan townsfolk and hounded out, sparking a curse that Norman must lift. True to the touchy-feely wholesome values of this film, that curse is lifted with empathy rather than pitchforks, with the upside that his family finally accept Norman for what he is, and more importantly he finally feels comfortable with his gift and understands that they truly do love him. The scene where his blonde bimbo elder sister (Anna Kendrick) grabs his hand and protects him from a mob is positively heart-breaking. The movie works on all sorts of more subtle levels too - I love that they cast geeky Christopher Mintz-Plasse as the voice of the bully - a role he'd never be able to play in a live action film. I love the balls-out bravery of the final joke between the elder sister and the guy she's been crushing on. I love the subtle and obvious reverential references to horror films throughout the movie. And I love the gentle humour and genuine chemistry between Norman and his eager best friend: "Don't make me throw the humus - it's spicy!" Overall, there's nothing not to like about this film. It's less dark than the Neil Gaiman penned CORALINE which many of the team here also worked on, but what it looses in darkness it gains in sheer heart. 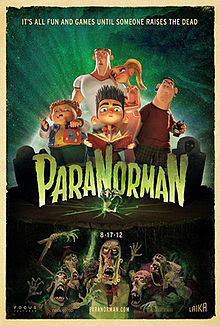 PARANORMAN is on release in Mexico, Iceland, the Netherlands, Hong Kong, Peru, Canada, Colombia, Taiwan, the USA, Vietnam, Belgium, France, Germany, Russia, Chile, Singapore, Slovenia, Romania, the Philippines, the Czech Republic, Brazil, Estonia, Finland, Pakistan, Greece, Portugal, El Salvador, Ireland, Norway and the UK. It opens on September 20th in Denmark, Poland and Sweden; on September 28th in Lithuania; on October 4th in Thailand; on October 11 th in Italy; on October 19th in Turkey; on October 25th in Argentina; on October 29th in Israel; on September 21st in December; on January 10th in Australia and Hungary; on January 17th in New Zealand and in Japan on March 29th. PARANORMAN has a running time of 92 minutes and the movie is rated PG in the USA.